AFTER becoming the first country in the world to frame an agroforestry policy, India has gone ahead and allocated Rs 444 crore to promote agroforestry in the country. The National Agroforestry Policy 2014, announced on February 10, has the potential to substantially reduce poverty in rural India and revive agroforestry industry. 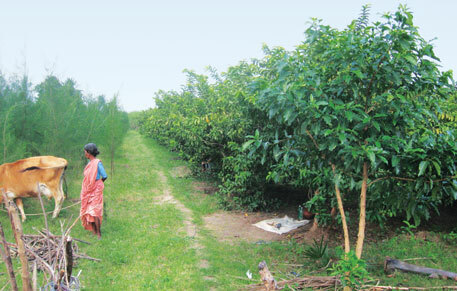 Agroforestry is a farming practice in which trees, crops and fodder are grown together on a farmland. Over 80 per cent farmers in India are small land-holders (owning less than two hectares). “Agroforestry will increase biodiversity in small farmlands, which will help mitigate climate change and improve the quality of soil. Also, as land-holding size is shrinking, combining tree farming with agriculture is the only way to optimise farm productivity,” says Ashish Mondol, a national advisory council member who steered the committee for drafting the agroforestry policy. Farmers in India have been doing agroforestry since ages in the form of homegarden where fruit trees and woody plants are grown together. The practice has seen a sharp decline in the past few decades, primarily because of strict laws and lack of incentives to small farmers. The policy will try to reverse this trend by relaxing laws and providing loans and insurances to farmers. India has been meeting its growing demand for agroforestry products such as plywood, timber, pulp and paper through imports, while the domestic industries have been under-performing. According to the National Research Centre for Agroforestry (NCRA), the country imported six million cubic metres of timber and round logs and spent Rs 18,000 crore last year. NCRA data suggests India has 23,220 saw mills, 2,562 large and small plywood mills, 660 pulp and paper mills. “These wood-based industries are producing only 40 per cent of their total capacity because more than 70 per cent of wood industries are small, which are dependent on wood from small farmers who are not encouraged to produce,” says S K Dhyani, director, NCRA, Jhansi. He adds that the policy might change this trend. Small farmers are not practising agroforestry primarily because of unfavourable regulation of felling and transporting of farm grown trees, such as section 41 of Indian Forest Act. The section restricts felling and transportation of trees grown even on private farmland, especially those species which are found in the nearby forests. The new policy talks of uniform laws for harvesting and transportation of farm grown trees across states. The sector, unlike the agriculture sector, lacks institutional insurance facility. The policy for the first time promises risk coverage to farmers practicing agroforestry against theft and natural calamities such as cyclone, storm, floods and drought. The farmers will also be provided soft loans for growing trees that have a long gestation period before they can be cut. Government estimates suggest that the policy will help increase the area under agroforestry from 25.32 million hectares to 53 million ha. “The policy will enable farmers to reap the benefit of agroforestry and help meet the country’s demand for food, fodder, firewood and timber,” Dhyani says. Agroforestry can also help reduce unemployment by creating job opportunities for chopping and transporting of trees. “As per estimates, 64 per cent of our timber requirement is met through trees grown on farms which generate employment for 450 people per day (450 employment-days) per hectare per year,” says Mondol. The policy also calls for setting up a board to coordinate the various agroforestry initiatives undertaken by different ministries. Government estimates suggest the rural development, agriculture and forest ministries are currently spending close to Rs 4,000 crore on different schemes related to agroforestry. The policy can also help the government implement the ambitious National Food Security Act, 2013, which makes it a legal obligation for the government to provide food to more than 800 million of the country’s population. “Agroforestry alone can increase agricultural production in a sustainable manner,” says Mondol. There is vast area of waste lands, about 65 million hectares in the country. Nature provides fast growing care-free growth plants which can be put to multiple uses.There are plants like Agave and Opuntia,both are care-free groeth and regenerative. Agave's lower lignin content (down to 2.4%) and higher cellulose content (62%) makes it ideal for production of Biofuel. Agave can be intercropped with Opuntia(Prickly Pear) which will be used to generate biogas for renewable electricity generation. Biogas power generators from KW size to MW size are commercially available from Germany,China,Vietnam etc. The cost of production per Kwh with Opuntia can be as low as US$ 3.00 per million BTU. On an annual basis,one hectare of agave can yield upto ten times the ethanol one hectare of sugarcane in Brazil. Agave to Ethanol's CO2 e emissions are lower than sugarcane and corn. Water - footprint -- agave does not have any. Agave uses water,light and soil most efficiently amongst plants/trees on earth. Agave is packed with sugars, on an annual basis one hectare of agave yoelds upto 10 thousand gallons of ethanol(from its sap/juice) and 6500 gallons of cellulosic ethanol. No other plant in the World has such potential. I have a plan: We have SPECIAL ECONOMIC ZONES (SEZ). Just like that we can start YOUTH ECONOMIC ZONES (YEZ). Wastelands can be given to youth on a lease basis(about 10 acres per youth) and 1o such youth can form a co-operative. They can cultivate fast growing multiple use plants like Agave and Opuntia. Power generation plants can be set up at local level. This way there will be decentralised power. This fits in Mahatma Gandhiji's Concept of AGRO INDUSTRIES utilising local resources and resourcefulness. Youth can be given short term training in Agricultural operations. This way we can provide employment to Youth besides bringing waste and vacant land under cultivation. What is more, large plantations of Agave and Opuntia lead to climate Stability as both are CAM plants. Crassulacean acid metabolism, also known as CAM photosynthesis, is a carbon fixation pathway that evolved in some plants as an adaptation to arid conditions. In a plant using full CAM, the stomata in the leaves remain shut during the day to reduce evapotranspiration, but open at night to collect carbon dioxide (CO2). The CO2 is stored as the four-carbon acid malate, and then used during photosynthesis during the day. The pre-collected CO2 is concentrated around the enzyme RuBisCO, increasing photosynthetic efficiency. Developing countries like ours which have millions of hectares of waste lands can transform rural economy by going in for Agave and Opuntia plantations on a massive scale. As one Exonomist put it, IT IS NOT THE LACK OF RESOURCES BUT RESOURCEFULNESS THAT EXPLAINS WHY PEOPLE PERISH IN THE MIDST OF PLENTY. Here is an interesting analysis on Jatropha in India.